Queen of Darts: It is time to formally present... The Serena Dress! It is time to formally present... The Serena Dress! It’s time to finally reveal the Serena Dress! With lots and lots of photos… be warned! 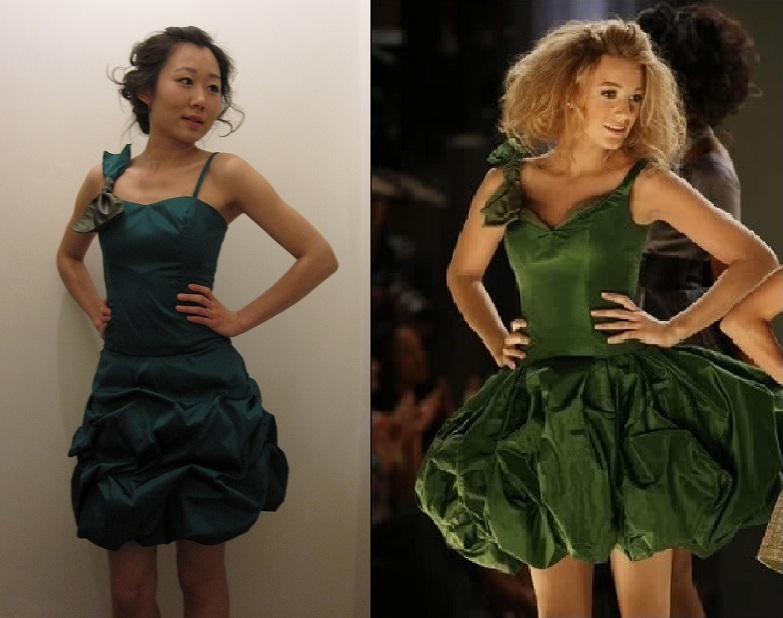 I hope it is clear (not only from the name I’ve given it) that my inspiration dress was the poofy green dress worn by Serena Van de Woodsen from Gossip Girl. Ohh it was love at first sight – I loved the drama from the skirt, which perfectly contrasts the tightly fitted bodice, the dropped waist and the oversized two-toned bow! So I went to Shepherd’s Bush searching for the perfect fabric – I wanted taffeta in a shade of green that suits my skin tone (believe me it can be tricky!) as it would give the skirt some body. Well… that was not what I found in the end! I came across something in a beautifully rich green colour, and it was claimed by the shop keeper to be silk dupion… Although I knew that what I saw was almost certainly NOT silk, I loved the colour and hand of the fabric (and it cost less than £4 per meter… d’oh where in the world could you buy silk dupion for that?) so was a very happy buyer. I bought 5 meters, and used this as both the fashion fabric and the lining (as it is comfortable next to the skin). I also bought some taffeta in another shade of green to make the bow detail, and to potentially make another project in the future. Despite how much I have been wishing, I don’t have a body (or hair!) like Blake Lively (who else has legs that go on for that long? and has a body that’s curvy but still lean?) or the lifestyle, I thought I’d make a few changes to the original design. I reduced the poofyness of the skirt. It is still by no means limp, but I think making it smaller will make it so much more wearable. I drafted the skirt as a half circle and the skirt lining much shorter and narrower. To learn to make a bubble skirt with pick-up detail, please see the tutorial HERE. I changed the neckline from a deep V-neck to my favourite sweetheart neckline which is a much more flattering shape for my body shape. The bodice of the dress is similar to that of my wedding dress – the neckline was based on Simplicity 4070 (need I say more?) and the width was reduced in order to achieve the tight fitting and extended the bodice for the dropped waist effect. After all the alterations, I was really happy with the end result. Of course I had to add the bow – that’s what makes this dress! It was relatively easy and in my mind adds sooo much to an otherwise single coloured and, dare I say, plain (?! ), dress. I couldn’t resist but add a TUTORIAL to show how the bow was made, in case anyone was interested. Now this baby took me 2.5 days to create! This is the first time that I didn’t use a pattern – so a lot of it was trial and error, and needless to say, there was a lot of unpicking! Thank god I had a long (not long enough) Easter break! After Day 1, I thought I was almost there… then after Day 2, I got to midnight before realising that it wasn’t gonna happen. What a classic case of underestimating the project! I had major issues with the zipper as I didn’t manage to sew the bodice and skirt together in a straight line… on several occasions! There was a lot of fabric to deal with, and I have learned now to mark the self –drafted pattern pieces… It is really true that planning is key to everything in life! After almost an entire day of unpicking and hand basting then machine sewing, I managed to get the zipper to look reasonable… not perfect, but I was happy with it… I also inserted the zipper between the outer and lining layer so the finish is really neat! I also had an obsession with the look of the pick-up skirt. There were a couple of times where it looked great with the pins in, but not as good once it was tacked with needle and thread. But after about 5 goes (I am a perfectionist – did you not see how long it is taking me to do the wedding dress? ), the skirt was exactly the right length, the right poofyness, with the pick-ups at the right place in the right shape. Phew! Despite all the unpicking, I really enjoyed the process as it felt adventurous. There is something intriguing about not using a commercial pattern – and to have the dress exactly how I wanted was so empowering. Ah I think I’ve talked more than enough now… time for more photos? Definitely. I couldn’t be happier with how the dress had turned out. It may not look as stunning as the inspiration dress, it had turned out just how I wanted. I think it fits me well (but note to self – do not wear it to a 3 course meal), it’s dramatic but not over the top, and it looks really fun! I think this is my new favourite wardrobe item, and I cannot wait to wear this and show it off! What’s more, the process of making this was really fun, now I want to make more copycat items! Beautiful dress! I actually think it's nicer than the inspiration, certainly more wearable. Great work! Oh beautiful job interpreting this dress for yourself! I love that colour, and the fit turned out really nice. I can't believe you didn't use a pattern at all! Thank you Heather! Not basing it on a pattern was challenging, but I hope to try that again some time! I love, love, LOVE it!!! You did a great job!!! It's absolutely stunning and still wearable in many occasions! I perfectly understand how challanging is to work on a self-drafted pattern, I already made and unpicked several time the draft bodice of my wedding dress, and now that I'm working at the skirt pattern I suppose I will unpick still more before finding the right shape (I'm a perfectionist too)! Excellent job .. it looks like .. and I can't see it that well that the original may have been created using moire.. maybe that helped it pouf out more.. but I like yours better .. and the inside work is excellent - thanks for sharing that very good handwork you did. Very good job .. looking forward to seeing more creations from you on Pattern Review. Hi what a beautiful self drafted creation! I'm LOVING your blog!! I found u via the Mad Men Challenge reveal. You make awesome dresses, all my style too :P Love it!!! Looking forward to exploring all your past projects.